My dear friends, this was the most delicious grilled cheese I've ever had since swooshing out my mother's vaginal canal some 28 odd years ago. 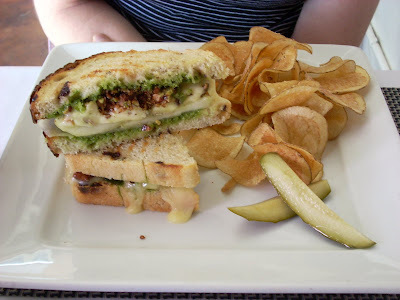 The majestic panini is filled with pear, brie, arugula pesto, candied walnuts on pressed rosemary currant bread. It just about brought tears to my eyes. But the story gets better. My first Element's exhibition was after a hike in Pasadena with my totally awesome lady friend, Shelley. I was on Day 13 of Quantum Wellness (no caffeine, booze, sugar, gluten, animal products for 21 days). I was hesitant to go out to eat and be an annoying DP, plus I have the will power of Anna Nicole Smith back in her reality show days. PS. In case you're wondering, I made it all 21 days. Shelley had me check the menu before we went in to make sure I could eat something. Yes, praise the Aztecs, quinoa salad! 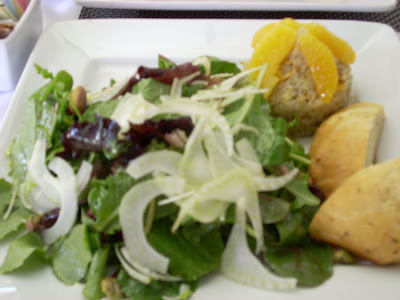 It was delicious - with orange segments, pistachios, fresh tarragon and slivers of fennel. I was really happy with my salad and black decaf coffee. 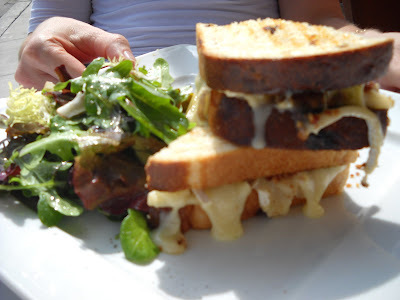 But Shelley had baby gold in her hands - the brie and pear panini. I swore I'd be back after my Quantum Wellness glory days were over. And after I completed Quantum Wellness, and Greek Orthodox fasting for 40+ days, I returned. It was after a beautiful hike with Shelley and we were running on low blood and booze sugar. 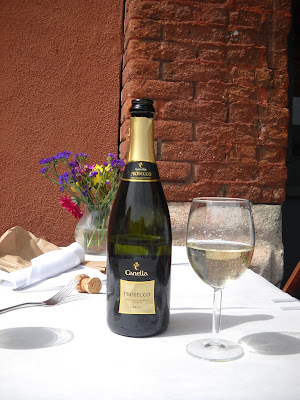 It was late Saturday afternoon, the perfect time to drink prosecco. Attempting to find some, we went to Ralphs, no dice. Drove through a parking structure labyrinth at Gelson to find a luke warm bottle of prosecco. Gross. But what do you know, good old upper echelon Pasadena's Gelson has a machine that chills your beverages for you while you shop. In the meantime, Shelley downs a pack of lifesavers. 10 minutes are up and we grab our sack and get the hell out. The first table outside with a friendly yellow umbrella is ours! BYOB no corkage, peace be with you. Now we both know why we're back, but also wanted to try something else so we got the brie and pear and the tuna tarragon paninis. It took days to make. The chef over grilled the panini and didn't want to serve it to us so he started over. They felt bad and comped our desserts. But it was worth the wait for thick ouzings of melted brie. Now, don't get me wrong. 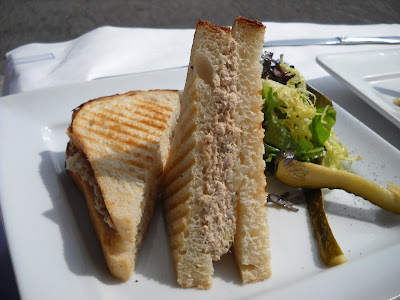 If I'd never had the brie and pear panini, I would have thought this grilled tuna panini to be tops. To our credit, we tried to venture out. I love anything pistachio. And I'm a banker. 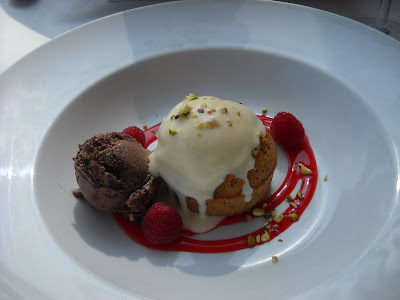 So of course, I got the pistachio financier cake with peach ginger ice cream and raspberry sauce. Also, I'm an oinkster so I added a scoop of brownie chocolate ice cream to it. The waitress told me the pastry chef thought I was funky for mixing flavors like that. Hmpf! The pastry chef must have been male, because didn't ya know, chocolate goes with everything? They make their own ice cream and I really have to give props to the ginger peach ice cream which was swarming with chunks of crystallized ginger and fresh peaches. The actual cake was quite dense and almost like a muffin. 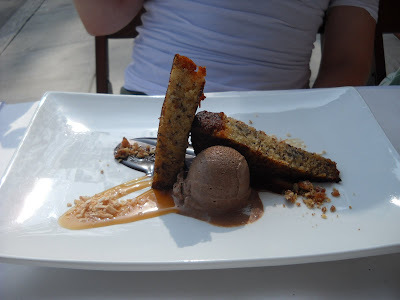 Shelley got the banana bread with coconut caramel sauce and chocolate ice cream. She devoured it. She loved it. I know my name is Anna Banana and my blog is Banana Wonder and I should be bathing in anything that's crescent shaped and yellow. But I don't really like bananas except when I get calf muscle cramps, which is all the time and I have to eat them for potassium injections. Oh, that was such a magical day! I have dreams about this sandwich. Best one on Earth as far as I'm concerned. Furreals! We need more of that goodness. Soon. My mouth is making "O" faces at that grilled cheese.